A Colgan Air DHC-8-400, N200WQ, operating as Continental Connection flight 3407, crashed during an instrument approach to runway 23 at the Buffalo-Niagara International Airport (BUF), Buffalo, New York. The crash site was approximately 5 nautical miles northeast of the airport in Clarence Center, New York, and mostly confined to one residential house (6038 Long St, Clarence) . The four flight crew and 45 passengers were fatally injured and the aircraft was destroyed by impact forces and post crash fire. There was one ground fatality. Night visual meteorological conditions prevailed at the time of the accident. Flight CJC3407 departed Newark-Liberty International Airport, NJ (EWR) at 21:20 on a domestic flight to Buffalo Airport, NY (BUF). At 22:15:14 the Buffalo Approach controller cleared the flight for an ILS approach to runway 23: "Colgan thirty four zero seven three miles from klump turn left heading two six zero maintain two thousand three hundred till established localizer clear i l s approach runway two three." The flight acknowledged that clearance. At 22:16:02, the engine power levers were reduced to flight idle. At that time Buffalo Approach instructed the crew to contact Buffalo Tower. The crew extended the landing gear and the auto flight system captured the ILS 23 localizer. The captain then moved the engine conditions levers forward to the maximum RPM position as the copilot acknowledged the instructions to Buffalo Tower. At 22:16:28 the crew moved the flaps to 10°, and two seconds later the stall warning stick shaker activated. The autopilot disconnected at about the same time that the stick shaker activated. The crew added power to approximately 75% torque. The airplane began a sharp pitch up motion, accompanied by a left roll, followed by a right roll, during which the stick pusher activated. During this time, the indicated airspeed continued to decrease to less than 100 kts. Eight seconds after the flaps had been selected to 10°, and at an airspeed of less than 110 kts, the crew retracted the flaps. Sixteen seconds later the flaps were fully retracted. Following further pitch and roll excursions the airplane pitched down and entered a steep descent from which it did not recover. The airplane impacted a residential house and was destroyed. PROBABLE CAUSE: "The National Transportation Safety Board determines that the probable cause of this accident was the captain’s inappropriate response to the activation of the stick shaker, which led to an aerodynamic stall from which the airplane did not recover. 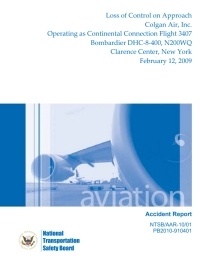 Contributing to the accident were (1) the flight crew’s failure to monitor airspeed in relation to the rising position of the low-speed cue, (2) the flight crew’s failure to adhere to sterile cockpit procedures, (3) the captain’s failure to effectively manage the flight, and (4) Colgan Air’s inadequate procedures for airspeed selection and management during approaches in icing conditions." Distance from Newark-Liberty International Airport, NJ to Buffalo Niagara International Airport, NY as the crow flies is 450 km (281 miles).